Mosalama, Doha. My Sarah Warren moment. Leaders often talk about an experience they had, as a youth, a young adult, that moved them to where they are today. It inspired them, gave them the tools to succeed, connected them with lifelong friends, etc. Sarah Warren, Director of Global Citizen Corps (a program of Mercy Corps for the youth) described at the conference a similar story of when she was a youth and had the opportunity to travel the world through a youth program. It was then when she believed she was destined to dedicate her life to making the world a better place, and today she is. 10 years from now, I’ll be saying that Mercy Corp’s, in partnership with Reach Out to Asia and the Qatar Foundation’s International Youth Gathering was that exact experience that pushed me forward. 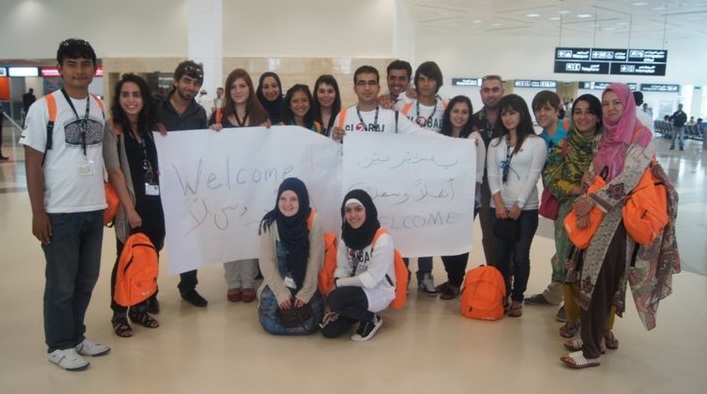 Youth from 9 different countries around the world came together for a week long program to improve their advocacy and leadership skills, and establishing “issue groups” to further pursue promoting certain causes back in their own communities. We learned how to tell stories through photography and video, improved our public speaking, how to use the social media (BTW my Twitter account is MojoThinkTank), how to successfully convey a message, run a campaign, etc. 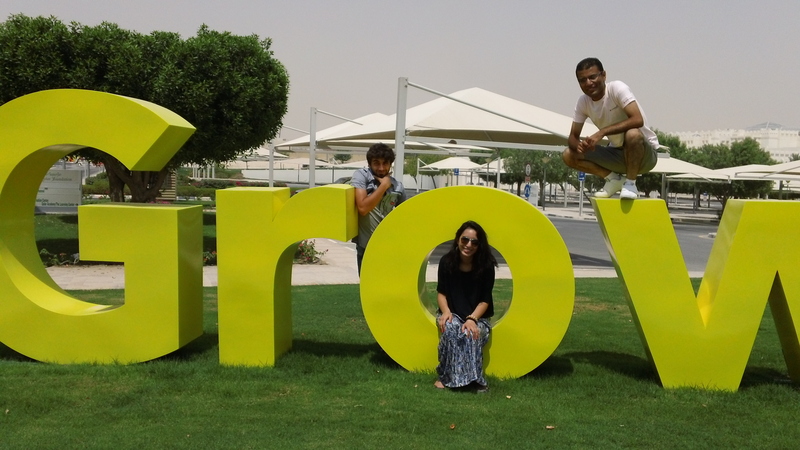 We explored Doha. In one scavanger hunt, we went through the ins and outs of Doha, checking out the water front, the supermarket, the hospital, a construction site, etc. which is not something you would normally do on a trip. But it exposed us to everyday Qatari life. We also went through a few Souks (bazzars, or markets) and interviewed the people who worked and shopped there. In one second-hand Souk, everyone we interviewed were foreigners–just migrant workers in Doha with families back home, trying to make a living. This became a theme as we explored the city, and lived it. All the labor jobs, like the ones at the construction site, or the janitors at Georgetown University which we spent most of our time at, are all migrant workers. Predominantly from India, Pakistan, and the Philippines, they work menial jobs for a low-wage and in pretty bad conditions. Some of the Qatari students we met during our time in Education City are researching migrant workers in Doha, and are advocating for better working conditions. Changes like, having them work at night when the heat isn’t as blistering as it is during the day (which can reach up to 120 F). In many ways, Doha isn’t too different than the Western world when it comes to its class structure. But the culture is different. Qatar is an Arab country, so evidently, their culture is Arab too. Half the men walk around in thobs (the long white collared gown) and koofiyas with aquls (the black and white/ white / red and white scarves on their head with the black band to keep it on their heads), which is the traditional Arab clothing for men. As one of our speakers described it, it is Arabic, as much Islamic, as it is practical of a wear. It’s light, and it’s white, perfect for the sweltering heat. The women cover. Many wear niqabs, and abayas. The abayas with hijabs. Although black, they are light, and the women are probably better off in the heat wearing those than jeans and a long sleeved t-shirt which many of us wound up wearing, in order to respect the conservative culture. The culture calls for hospitality and respect from all to each other. You never ask someone for anything, without inquiring about themselves, their family, or their health. You greet everyone, and you say good-bye to everyone. This comes in nature when living in an Arabic country, and one thing that I will greatly miss back here in the United States. The most notable experience, which has left me hanging here back at home and thankful that social media exists, are the people I met in Doha. From around the world, and from Doha herself. I was astounded by the amount of people who have lived, and been impacted by war. But, I guess that’s a given if you’re from the Middle East. The Lebanese, Iraqis, and Palestinians, all had stories to tell about the recent wars. Mohammed Annan, a Lebanese university student, showed us pictures of the 2006 Lebanon-Israeli war, where Lebanon held Israeli soldiers as hostages and Israel in turn bombed Lebanon. Although I don’t have the pictures to display here, I can assure you, the city–his city he showed us, was devastated by the bombs. Looked like a war-zone, only, it was happening in the bed of citizens. The question I would ask, is, at what cost does Israel’s security come at? Mohammed said thousands of Lebanese died from this war, and after seeing the pictures, I don’t doubt him for a moment. After a few days of the gathering starting, the Palestinians finally made it. They, as I like to say, broke the senseless siege. They waited at the actual border for 12 hours straight at one point, only to be continuously denied exit by the Egyptian authorities, although they had the necessary papers to leave Gaza. It was only until the last 5 minutes before the closing, Monday night, did the authorities finally let them leave. The Palestinians were the last ones to leave the gathering–we haven’t heard yet if they’ve been able to get back into Gaza. While social injustice may be universal, the wars that plague many of these nations, poverty, food security, climate crisis, are far greater in their countries than what we face in the United States. More than one time, I had an urge to say “I’m sorry”, coming from the role as a US representative. I’m sorry for occupying your country. I’m sorry for supporting a country that continues to treat you like second class citizens in your own homeland. I’m sorry that we contribute to the flooding, and high food prices. I am sorry. I know that I, as an individual, did not contribute to the atrocities of this country, but I as an individual have a responsibility to help stop it. 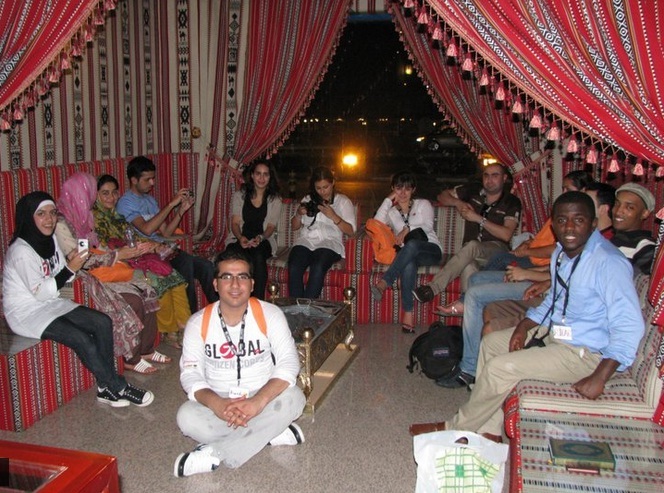 Doha was my Sarah Warren moment, because it connected me to people from around the world, allowed me to learn their stories, and for the issues they face in their countries to become personal. It put a face on the world’s problems. Everyone at the gathering I have become close to, and I have a feeling, will be connected with them for a very long time. Coming from the United States, I hope I can help bring about long-lasting change all the way from back here by advocating for changes in foreign policy. Wherever I’ll be in 10,20,30,40,50, whatever years, I know I’ll always look back and see this as my Sarah Warren moment. The moment that motivated me to be the change I want to see in the world, and I’ll forever be thankful for Mercy Corps, Global Citizen Corps, and the youth leaders for that. I really glad you had such a wonderful trip, Dina. Thanks for sharing it with us via your blog! I hope you can visit Lincoln’s Arabic classes next year and share your experiences with other students when you’re in town! Great work, Dina, can we cross post this blog on the GCC site?